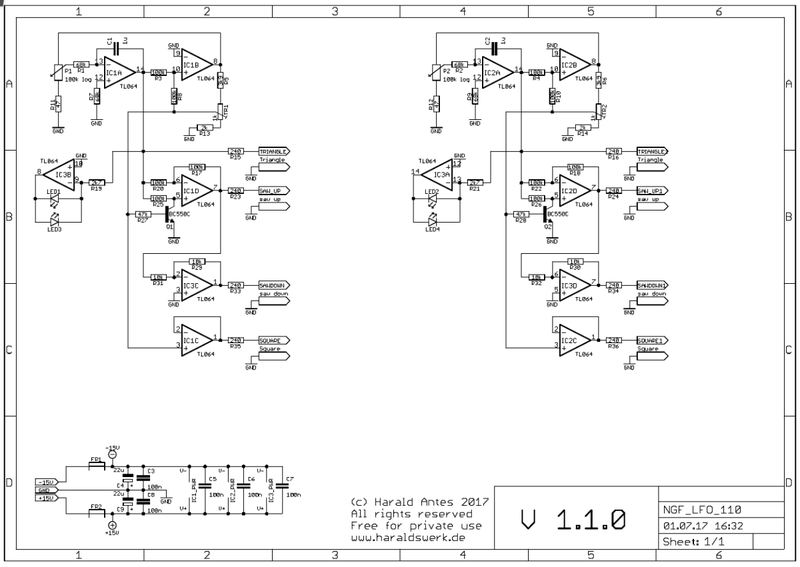 This is the LFO module for my Next Generation Formant project. It provides triangle, ramp up, ramp down and square wave output (-5V to +5V). This design follows closely the original from the Elektor Formant. The oscillator consists of an integrator IC1A and an OpAmp Schmitt-Trigger IC1B. The triangle wave of the oscillator arises through the feedback of the trigger output to the input of the integrator. At the integrator output IC1A arises a triangle with the amplitude of the hysteresis of the Schmitt-Trigger. The input voltage of the integrator sets the rise and fall time of the voltage output. The square wave output is buffered with IC1C. The circuitry around IC1D provides the saw output. IC3C inverts the saw.